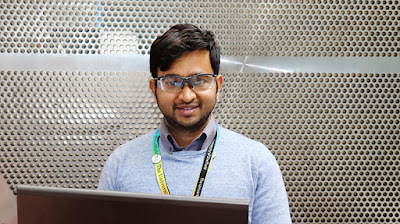 Rahul Mandal, the Rotherham-based engineer who impressed everyone with his creations to win the recent series of The Great British Bake Off, is helping to inspire the next generation of engineers. The University of Sheffield Advanced Manufacturing Research Centre (AMRC) has teamed up with Primary Engineer – a national not for profit organisation bridging the gap between industry and education - to develop engineering skills for teachers and inspire children to see themselves as the problem-solvers and innovators of the future by bringing engineering to life in classrooms across the Sheffield city region (SCR). In the inaugural year of the partnership schools from the city region are taking part in Primary Engineer and Secondary Engineer teacher training programmes where teachers are partnered by "classroom engineers" from the AMRC and trained to deliver whole class engineering activity for pupils. Rahul said: "Programmes like this are incredibly important for empowering teachers with the right skills. They need to bring engineering to life in the classroom in a fun and creative way. We need to make a real impact on young minds to try and inspire more children in the Sheffield city region to consider engineering as a cool career. "I became a STEM Ambassador, to help inspire young kids to do science and engineering because I think there is a huge need for more engineers. If we want to inspire people, we need to do it from school age level." He added: "If you can do baking, you can do science and engineering and if you're doing engineering, then you can bake. The programme culminates in a celebration challenge event at the AMRC where teams from each school will bring along their project entries and compete against fellow schools. To spark pupils' imagination, engineers from the AMRC will visit schools to talk about engineering and their role within it, they will also give examples of how engineers solve problems. Awards will be presented to the winners at an annual prize-giving event hosted by the AMRC followed by a public exhibition of entries from all participating schools. Staff and students from the AMRC will select and build a prototype of one or more of the shortlisted designs. Cllr. Gordon Watson, Deputy Leader at Rotherham Council, said: "This scheme inspires children to get involved in science and technology at an early age. "It gives pupils the opportunity to try something new, get creative and develop their engineering skills in the classroom. The Advanced Manufacturing Research Centre also provides teachers with suitable resources and expertise to guide engineers of the future."